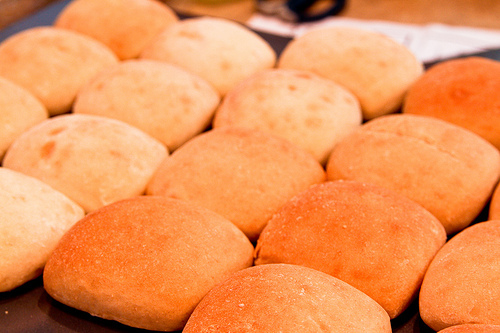 Pandesal is a Spanish word for “salt bread”. It is a rounded bread usually eaten by Filipinos during breakfast. It is made of flour, eggs, lard, yeast, sugar, and salt. It has a soft, powdery texture, and is eaten in a number of ways combined with sandwich spreads. Despite the literal meaning of its name, the taste of pandesal varies from bland to slightly sweet. One of the methods in bread making is the straight-dough method. The procedures are simple and can be done in your own home. 1. Preheat oven at 175oC. 3. Knead the dough, place in bowl, cover with damp cheesecloth and leave for two hours. 4. Punch dough to remove air. 5. Divide the dough into 16 equal portions (about 550 g. per piece). 6. Form each dough piece with approximate length of 30 inches and roll in breadcrumbs. 7. Rest dough for 45 minutes. 8. Cut dough into 20 equal portions (about 27.5 g. per piece). 9. Roll in breadcrumbs and arrange on baking trays in cut side up manner. 10. Proof until double in size in warm and moist proofing cabinet (about 32-34°C with 85% relative humidity). 11. Bake for 12-15 minutes or until golden brown. Finished product will result in 2,700 pcs. of pandesal. DTI Provincial Office where the business is located. Municipality or City where the business is located. BIR Regional or District Office where the business is located. BFAD Regional Office where the business is located. di ba 30kg ang flour, bakit po 16 portion of 550gms each?16×550=8800kg lang po. ilang batch po ba ang gagawin? Thanks 🙂 it helps me..
,,salamat sainyo? marame nakuhang tips at empormas yon,, gustuko ksng magkaron ng sareling kong bakery,, salamat, joemel a beltran. I hope you could also indicate the place where to buy the low cost ingredients/materials of any of the bussiness ideas you post. thank you! It is really interesting and helpful. Hope to see more. 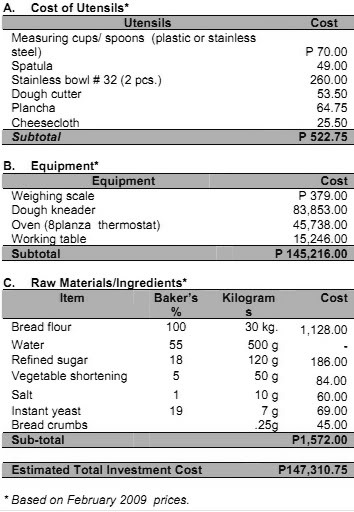 are the quantities of your ingredients for pandesal recipe accurate particularly on the bread flour (is it really 30 kg)?